First of all, we don’t call our customers “consumers.” We are all people who eat. Consumer is such a dehumanizing word. Grass-fed beef does not contain growth hormones, antibiotics and pesticide residues. The meat has less fat, fewer calories and less cholesterol than skinless chicken breast. Grassfed beef has two to four times more omega-3s, the “good fat” and conjugated linoleic acid CLA’s. Omega-3’s are an important building block in every cell of your body. People who eat food with more omega-3 and CLA’s are less likely to have heart problems, develop cancer, arthritis and high blood pressure. They are also less likely to suffer from depression, attention deficit disorder and Alzheimer’s disease. Grass-fed beef is loaded with vitamins A, D and E as well as beta-carotene. A nutritionist friend of ours tells her patients they can eat grassfed beef three times a week but must limit conventionally raised beef to once a month at the most. Farmers who sell directly to the consumer realize a greater return on their investment which goes back into supporting the small family farm. Also, manure from grainfed beef has an unpleasant odor while grass-fed manure hardly has any odor at all. The farm and barnyard is a much more pleasant environment for everyone. 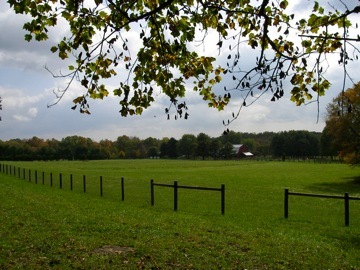 And grass farming is beautiful and a great environment to live in. 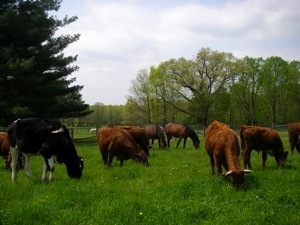 Grassfed cattle live a natural, humane life with their herd. Cattle are ruminants with a digestive system designed to eat grass and forages. Of course they love to eat grain just as people love sugar. But grain is not good for cattle any more than unlimited sugar is good for people. The antibiotics that stockyard operations pump into cows are given to overcome the effects of the grain they are fed. Cattle thrive on what the food they are meant to eat – grass and forages. Grass-fed beef is delicious! It has a superb beefy flavor that puts the alternative to shame. Grass-fed beef is lean and requires less cooking time. When using grass-fed beef in a recipe, reduce the heat by 50 degrees. We have grassfed cookbooks available in our farm store. •Grassfed steaks on the grill need to be seared quickly on each side over high heat to seal in the natural juices, and then reduce heat to medium or low to complete the cooking. •Grassfed roasts are delicious in stews and with slow, moist cooking recipes such as pot roast and beef burgundy. Check out these articles on the health benefits of grass fed beef. We live and work on the farm so come any day. But please call ahead to make sure we will be here. On Wednesday afternoons you can also shop the Hopewell Farm Market at the Hopewell Train Station for more great food from local farmers.